Thursday was national Take Your Child to Work Day. My company has actually participated in this for a number of years but this is the first year that I got to bring Austen since the minimum age requirement is 6. Of course we had to tell Peyton that he was going to the doctor to get shots so she wouldn't want to go too. She's used to Austen going to school with her so the fact that Austen went with me and Peyton went with her dad to go to school, was not lost on her. I actually thought we had prepared her sufficiently but just as Austen and I were almost out the door, she started crying. Austen and I felt bad but we were excited for our day ahead. I asked Austen if he wanted to take the bus to work. He left it up to me so we drove. When we entered my building, security greeted him by name and gave him two bags of chocolate covered pretzel sticks - one for him and one for his sister. We went up to my office and got settled before we started on some work (signing and addressing cards for me and stamping and sealing for Austen!). We then had a breakfast for all the kids who came to work with their parents that day. After that, Austen and I went on a tour. 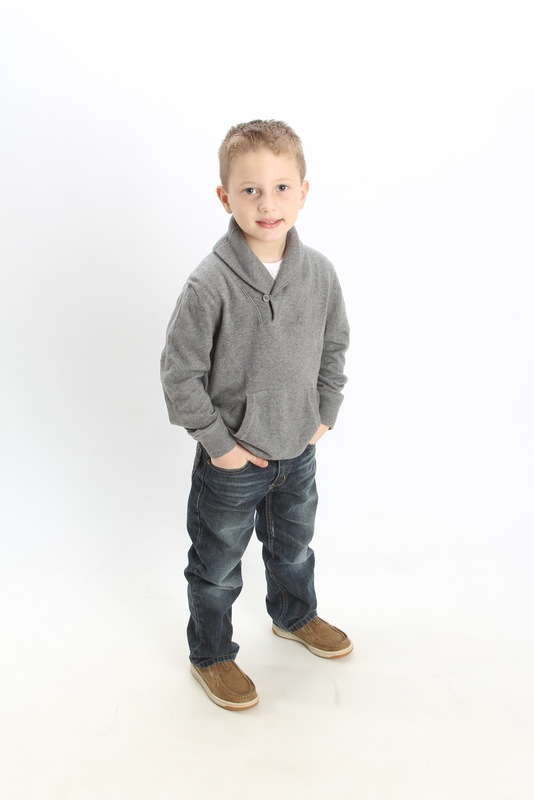 I introduced him to a lot of people or rather he introduced himself by saying, " Hi, I'm Austen, I'm 6." He grew tired of this after the first 30 people or so, so we took a break and went back to my office so Austen could write and draw about his morning so far. At 11 a.m., Austen and the rest of the kids participated in a mini-medical school put on by my staff. They learned about their bones, their organs, germs, nutrition, etc. He got a workbook and did great matching up the instruments to the correct body part. After mini-medical school, it was time for lunch. Austen was starved, so we went out to lunch together. It was then that I realized how exhausted I was - being a mom and working all at the same time at work! When we got back, I had a few meetings and Austen had to complete his questionnaire for the day asking him what he wanted to be when he grew up (a basketball player) and what was the most surprising thing about his mom's work (all the people) as well as the most fun thing about today (lunch). At the end of the day, all the kids got together to pose for a photo and with only an hour left, Austen was asking if it was time to go pick up Peyton from school yet. I knew he was tired and ready to go home. I let him play on the iPad while I wrapped up a few last minute tasks and then we ended our first official Take Your Child to Work Day. I was exhausted but glad Austen and I had some good bonding time together. So this weekend is Greek Easter. 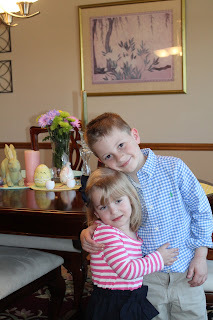 That's what I was waiting for to post my Easter shots of the kids. Okay, really I forgot until I found them on my camera and realized that I hadn't uploaded them to the computer. So here's a recap of our Easter. The day started off with an Easter egg hunt indoors at our house in the city. From there we ventured to one Grandma's house for a very competitive Easter egg hunt complete with uncles and cousins. Competitive Austen got paired with my very competitive older brother who hasn't lost an Easter egg hunt yet. It came down to a final call and Austen almost was in tears while Grandma decided the victor but he held it together and was a winner. His reward - iTunes gift card and a big Easter basket (okay, Peyton got one too). From there we went to the other Grandma's house where playing the yard was once again a highlight. This Grandma had sent fun Easter decorations for the windows which the kids arranged. The kids would partake in an Easter egg hunt year-round if they could. In fact, they do. It's one of their favorite games to play - us hiding the plastic eggs around the house and them having to find them. You'd think that would take some of the fun out of Easter when it actually rolls around but if anything, it just makes them even more skilled at finding the eggs! Austen is quite the competitor. But he doesn't like to lose. He makes a competition out of everything - who can get their pajamas on faster, who gets to the door first, who brushes their teeth first. Never mind, how he acts when he's just playing your standard board games or sports. He's also competitive with himself. When he does spelling at home or school, you have to read him a list of words and you can't tell him what he gets right or wrong until all the words are read. When you're done telling him the words to spell, you must check his work, giving him a check mark for all the ones he gets right and write the correct spelling of the word under the ones he gets wrong. He's hard on himself when he misses often collapsing on the floor and pouting, but I tell him that's how you learn. So we're trying to teach him that it's okay not to win all the time or to be perfect. Tom and I beat him in games just so he knows he can't win everytime. He's not going to be one of those kids on the sports fields who can't leave it on the field and cries at the end of every game he loses. Being competitive is a good trait to have and I am glad he is competitive, I just want him to learn the art of losing gracefully too. So, we're starting now. I'm Not Wearing that Shirt! Ever since Peyton turned three, she's definitely let it be known what she will and what she won't wear. This is especially troubling for me as I'll admit, I'm a little bit of a control freak about my kids' clothes. I want to make sure that wherever they go, they look presentable and somewhat match. I've been lucky with Austen. He's six and so far has rarely challenged me about what I put out for him to wear. I chalk it up to being a boy. He could care less about clothes aside from the occasional comment about having to wear constricting jeans. Peyton is an entirely different story. I had to take all the clothes out of her cubby in the bathroom at school because she would go in there and just change clothes a few times a day because she felt like it or because she didn't want to wear that shirt, pants, socks, etc. I have to watch her in her bedroom too because she'll go downstairs and totally change her clothes to what she wants to wear including putting on a different pair of inappropriate shoes (think sandals in the middle of winter). I thought a good compromise was letting her pick out her pajamas for bed. She does this every night and I have no problem with this, as long as they match! But now she's weighing in on what I put out for her for school so I have to get her buy in for the clothes she wants to wear that week...and usually what she picks has some meaning. For example, on Mondays she likes to pick shirts or underwear that have something to do with ballet since she has ballet on Mondays. 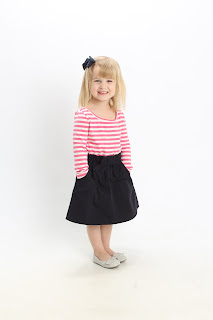 I can only imagine the clothes battles we will have when she gets older if it's starting at age three! Can't wait for those.